...Παρακάτω σας παρουσιάζουμε μια μαρτυρία γραμμένη στα αγγλικά ενός ομογενούς που γνώρισε για τον π.Γερβάσιο μέσα από τις εμπειρείες της γιαγιάς του, την οποία δημοσίευσε στην προσωπική του ιστοσελίδα. I came to hear of Elder Gervasios when I was a teenager visiting my grandmother who lived in Patras, Greece. It was the early 1990's and the influence of this saintly clergyman was still very strong in Patras even though he reposed in 1964. There was a missionary spirit in the city inspired by Elder Gervasios and everywhere you went he had left his mark in one way or another. Patras was one of the few cities at the time that had a 24-hour ecclesiastical radio station and also had ecclesiastical TV broadcasts as well that have now expanded onto the internet. Many clergyman were inspired by the Elder, and Patras was noted as having some of the youngest and most devoted and zealous clergymen in all of Greece. 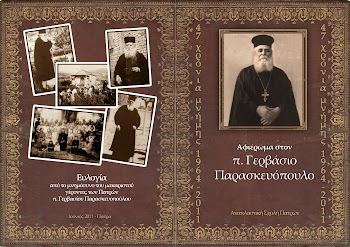 With its many catechetical schools founded by the Elder as well as a seminary, there were estimates that Patras had somewhere in the vicinity of 3,000 theologians.My father heard Elder Gervasios teach as a young boy when my grandmother would take him every Sunday to one of his catechetical schools. My father is not a very religious man and enjoys a good joke about the church here and there (as many Greeks tend to do), but he is a believer and through my influence as well as my brother-in-law who is a priest he does have a deep respect and hidden piety within him. This especially comes out when you ask him about Elder Gervasios. He was young when he first saw him and cannot remember a word he said, but he always tells me how the image of Elder Gervasios is still very vivid in his mind. For my father, the image of Elder Gervasios is the standard image every priest should have because he radiated tremendous respect and holiness. 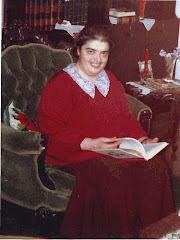 My father has even pointed out that one reason he does not go to church is because the priests of America, who for the most part do not wear a rason and even shave their beards, do not inspire him like that image embedded in his mind decades ago of Elder Gervasios.My grandmother also held high regards for Elder Gervasios. She never spoke many details about him as I did not know too much about him to ask before she passed away, but when I did ask her eyes would open and she would do a circular motion with her hand many Greeks do to express a certain wonderment. For her, he was untouchable when it came to holiness and no one in Patras since his repose had ever done as much good for the city. In her eyes, Elder Gervasios was the ideal clergyman.During my visits to Patras my grandmother would take me to places associated with Elder Gervasios. I gave one example here. Another time, since I had never been to confession, my grandmother took me to a priest who was fairly young and probably the most noteworthy confessor in the city at the time who served at the beautiful Church of Saint Nektarios. This priest was also influenced by the Elder and many at the time viewed him as "another Gervasios". There were always expectations of the people of Patras to have another Gervasios serve in their midst.A few times we attended services at one of the more well known convents of Patras known as the Convent of the Prophet Elias. It is a beautiful monastery half way up a mountain leading to another men's monastery known locally as the Gerokomeiou. 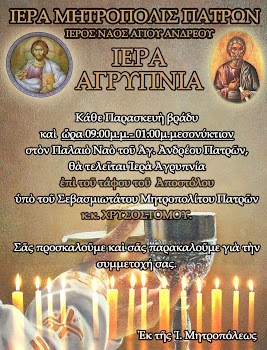 I remember one day in particular when we attended the Great Vespers while the Metropolitan of Patras Nikodemos was serving. This was the same Metropolitan who as a young boy attended the now legendery services officiated by St. Nicholas Planas, and besides writing a book on his life story was also the main proponent for getting him canonized officially by the Church of Greece. Sort of like the impression my father had with Elder Gervasios, I remember when Metropolitan Nikodemos ended the service he looked straight at me and signaled for me to be the first to come and venerate his Cross upon the dismissal of the crowd. Saint Nektarios surrounded by some of his students at Rizarios School in Athens, among whom Elder Gervasios was one of his favorite pupils. Inside the church of the Convent was a relic of a miracle associated with Elder Gervasios. 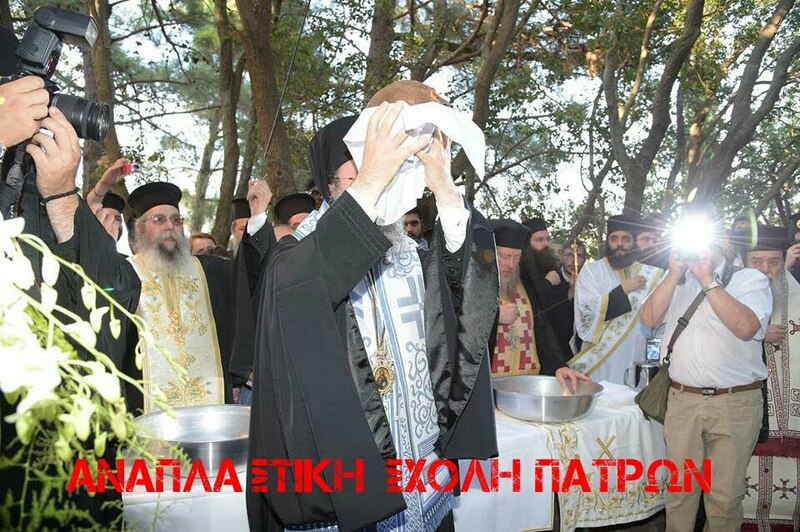 Here is an account of what took place:"During the days of Meatfare, Father [Gervasios] used to take the catechetical school children and they would go up to the Hermitage, which is now the Convent of the Prophet Elias. On February 17, 1929, Father and his spiritual children devoted themselves to planting a few trees in the area near the aforementioned Hermitage. Father himself with a few of the children also planted a pine tree after reading a special prayer. From that time 31 years went by. In August of 1960, this pine tree was cut down together with other trees to serve as firewood at the children's camp of Sychainon. The woodcutter was amazed when he noticed that at the root of the tree a beautiful Cross had miraculously been formed with different colors. He immediately reported this to the Metropolitan of the time, Constantine (Platis), who hastened to the scene of the occurrence bringing a few chemists to confirm this phenomenon. The chemists used a few liquids to eradicate the Cross from the tree, but not only did they not achieve this, but the Cross became more and more distinctive. By means of the microscope they confirmed, as it is said, that at its four ends icons of the Nativity, the Baptism, the Crucifixion and the Resurrection were miraculously inscribed. After all these certifications they confessed that it was a supernatural phenomenon. 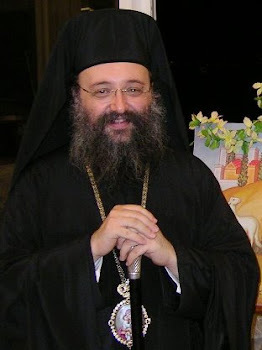 The Metropolitan of Patras, convinced now that it was a miracle, gathered the people at the Church of Saint Paraskevi, Sychainon, where the children's camps were, and after he finished Vespers and a supplication of thanksgiving he addressed the people and made known to them the facts of the miracle. 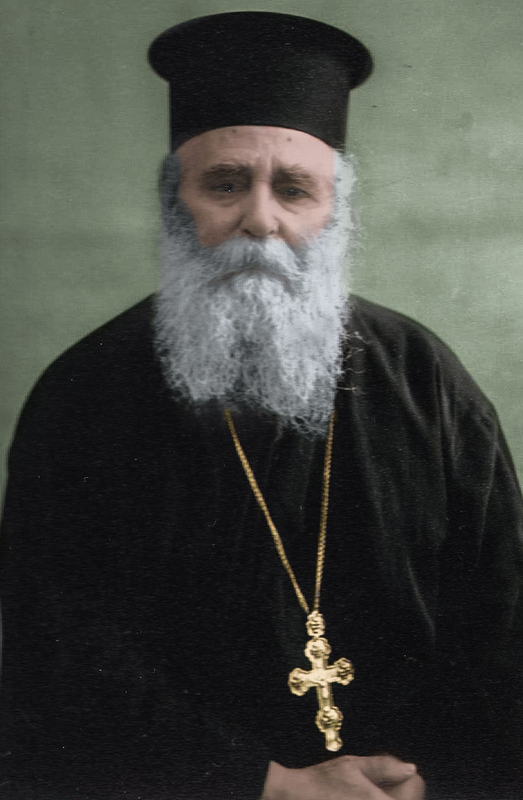 Father Gervasios, who was there, took the microphone and said, crying and thanking God: 'My brethren, this miracle did not happen for my sake, because I am a sinner. It happened for the sake of the good and sinless children, who also planted this tree.' What a height of humility! When the people heard the Elder himself confirming the miracle, they shed tears as they glorified God, who knows how 'to glorify those who glorify Him'. Such Crosses exist today in the Monastery of Gerokomeiou, at the Metropolis of Patras, at the Convent of Prophet Elias and at Saint Paraskevi, Sychainon. "I venerated the miraculous Cross, which bore jewels and metals to indicate its many miracles as well as other relics of Saints. I also went out back where there is a shrine in the wooded area where the Elder planted the trees together with the children. When people visit they recall Elder Gervasios and tell stories of their own experiences with the Elder. Αναρτήθηκε από Αναπλαστική Σχολή Πατρών στις 6:28:00 π.μ.